Who hasn’t fallen over in the past 12 months? If you didn’t, then you are lucky. The statistics puts it about every 10 months. However, avoiding falling over is probably the most important lesson. It is always better to have a fence at the top of the cliff, rather than an ambulance at the bottom! So let’s begin by thinking about all the disasters, how you can avoid them and what to do if the ultimate disaster does occur. The first, and often the most common, is dropping the camera. Cameras are very complex devices full of electronic trickery and mechanical movements. The shutter on even the cheapest camera can open and close in 1/500th of a second. It doesn’t take much to knock the delicate shutter around. The camera is also a lightproof box, dropping it and distorting the case will soon let light in. So what should be done beforehand? 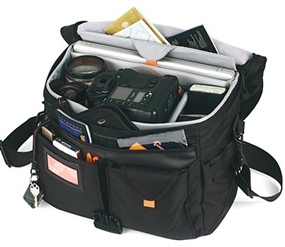 First is to have a decent padded camera bag. My own one cost over 1000 baht – but it will keep the camera safe in the situation of it falling out of the car or slipping from the shoulder. If you have one of those leather cases, you should throw it as far as you can. And do it today. It will not save your camera from any hard knocks. Another important point – always loop the camera strap around your neck. OK, so now you have the camera hanging on the strap around your neck, what can go wrong here? Well the strap can slip or the eyelet rings can break, and the whole lot hits the floor unless you have lightning reflexes. Answer? Check and make sure that everything is correctly attached and not worn. Replace regularly. Especially the eyelet rings. So it did hit the floor, what now? Turn it on. Is it still electrically OK? If no power, take the batteries out and then put them back in – they may just be jolted out of position. Unscrew the lens and put it back on. Look through the viewfinder – if it looks normal, then try to take several shots at different shutter speeds and apertures and carefully look at each one, blowing them up if necessary. Pray a lot. You may be lucky. After dropping, the next disaster is water. Cameras are not like children, you cannot “drown proof” them. They stay drowned. In the rain you must take precautions. A plastic bag wrapped around the camera with just the end of the lens poking through, and held on with rubber bands is the way to “safe photography”. Even then, as soon as possible you should take the camera inside and dry the outside of the case thoroughly. Take the lens off and dry carefully around the lens mount too, making sure you do not touch the mirror. Take the batteries out and thoroughly dry the battery compartment and the contacts. Batteries and moisture do not go well together. Now we should think about the great shots you can get on board speedboats and similar situations. Resist the temptation to take your good camera – you can buy a waterproof Kodak for very little money and you can relax with peace of mind. Or even one of the disposable ones. Do not take your good one! So what do you do when you drop the whole lot in the drink? If it is a modern electronic camera you have probably just lost your investment – especially if it is salt water you drop it into. One camera technician’s advice was, “Leave it there!” However, you can try flushing the camera in running tap water for at least an hour, then drying it and taking it to the repair shop. An audience with the Pope would be a good move as well. Drowning the camera in fresh water is not quite so bad, but you have to pull it apart as much as you can and then dry it out as thoroughly as you can – a hair dryer set on “No Heat” can help, but again your chances are slim. The message is first aid is possible, but prevention is much better!